The layout of our motorhome is quite unique to others. 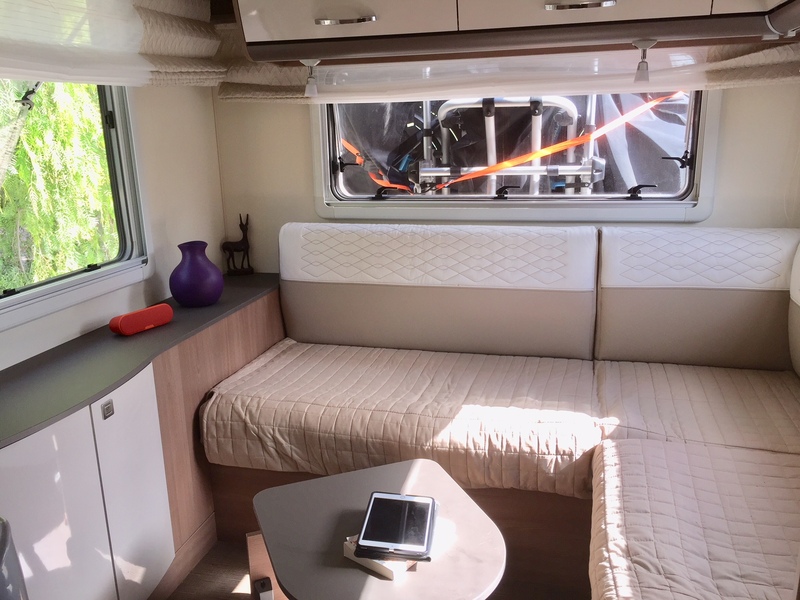 It has a very comfortable rear lounge which has a good size L shaped sofa. 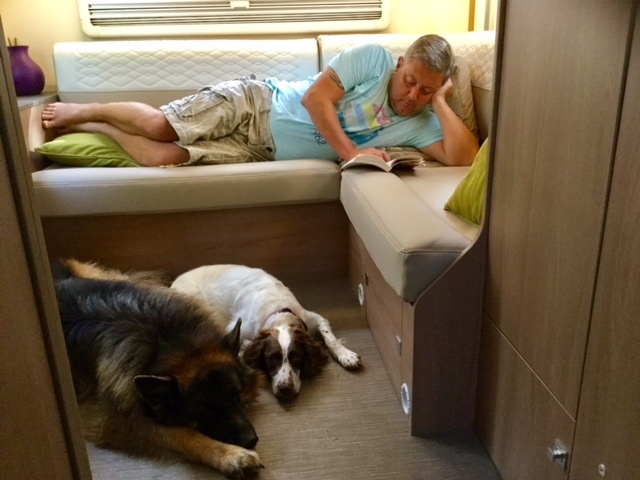 The sofa does not become an uncomfortable bed like it does in other motorhomes. Above the lounge is a king size bed with memory foam mattress that can be left made up and is very easy to put into position at the push of a button. There is also plenty of storage, there is a single and a double door base cabinets both with shelving so we keep our music speaker here so we can listen to music when chilling out, books along with an array of other items. There are 4 eye level cabinets where we mainly keep our clothes, towels and bedding. It has a hidden coffee table. When you pull the coffee table out you can adjust the height underneath so that you have a table which is more practical, especially when you have two dogs with very waggy tails! The table has a bottom shelf and can be used for extra storage too. Another feature we love is the multiple LED lighting options in the lounge area. There is a main ceiling light, eye level cabinet lighting or individual spotlights which can be altered or slid along the rail and placed in your ideal position. You can have all the lights on at the same time or you can pick and choose your combination. The 3 windows not only give you a panoramic view they also give you plenty of light and ventilation on a hot day. The sofa is large enough for both of us to put our feet up and the there’s enough room on the floor for both the dogs to have a snooze at our feet. 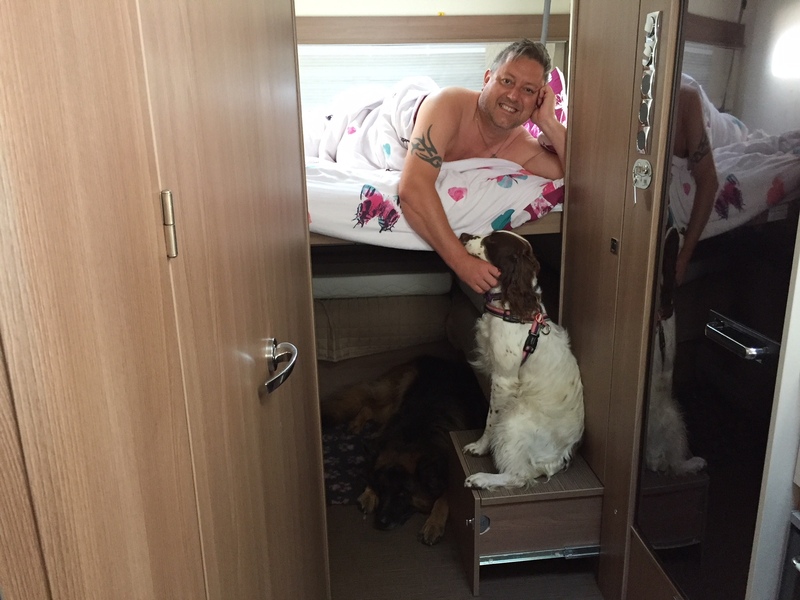 I must say you all look very comfortable in the lovely Motor Home. I know you both have been used to a luxurious home before travelling, but you all seem very happy living in the Burnstner. I must say the design does seem far superior to a lot of other makes. Copyright © Rewind The Gap 2018 | Web Design by eWebz | All Rights Reserved.